Foodies everywhere, get your forks ready! Our picturesque region of Lehigh Valley is an incredible destination for your next culinary adventure. Our favorite restaurants in Bethlehem, PA offer something to please every palate. From family-owned joints serving up comfort food classics to high-end eateries turning out inventive, modern dishes, these restaurants can’t be missed. The next time you stay with us, check out these 10 places for memorable meals, delicious drinks, and, of course, a good time! You can find out more about all of the fun things to do near Bethlehem, PA when you download our free Vacation Guide. It’s full of the best recommendations for things to see and do like enjoying the best restaurants in Bethlehem, PA. The name says it all – this 1920’s style speakeasy offers Prohibition-era cocktails and beautifully crafted American cuisine. At The Bookstore Speakeasy, you’ll find delicious small plates including local artisan cheeses, smoked meats, and homemade desserts. And, of course, a long list of specialty cocktails, beer, and wine. Named one of the “Top 100 Best Restaurants in America” by OpenTable, Bolete uses local and sustainable ingredients to craft incredible dishes. The restaurant offers an ever-changing seasonal menu that never disappoints. However, for something extra special, make a Tuesday, Wednesday, or Thursday evening reservation and try the six-course Chef’s tasting menu. 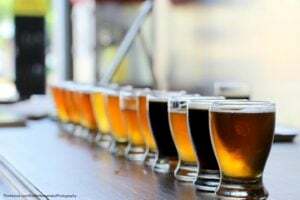 We like Bethlehem Brew Works so much that we’ve devoted an entire blog post to telling you the reasons you need to visit. Honoring Bethlehem’s history as a steel town, this brewpub serves a variety of yummy sandwiches, burgers, wings, salads, and soups. Some recipes are “beer enhanced” and incorporate beers straight from the on-site brewery! Emeril’s Chop House is one of several amazing restaurants at the Sands Casino in Bethlehem, PA. 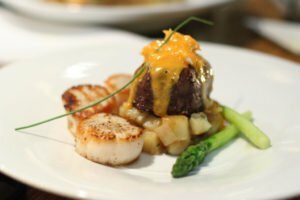 The upscale restaurant offers classic steakhouse recipes with a modern twist. At Emeril’s, indulge in a variety of irresistible dishes including tender steak and mouth-watering prime rib. Featuring a perfect fusion of French and Asian cuisine, the menu at Edge Restaurant and Lounge offers a wide selection of modern dishes. You’ll find pan-seared foie gras, mushroom risotto, and Thai chicken curry, among other options. In addition, they also have an impressive wine list filled with perfect vintage options to complement your meal. Molinari’s fits the bill if you’re looking for delicious Italian fare in a warm and inviting atmosphere. The Italian restaurant uses fresh, local ingredients and simple flavors to create scrumptious dishes. Choose from classic favorites like antipasti, pizza, and pasta that will leave you feeling full and satisfied. Located on Main Street in downtown Bethlehem, Tapas on Main is a wonderful place to go for dinner with friends. The Spanish-style tapas restaurant offers small plates of assorted meats and cheeses, flatbreads, and other tapas. Their plates are great for sharing and you’ll be able to easily have a taste of everything! For over 15 years, Apollo Grill has been voted one of the best restaurants in the area time and time again. Apollo Grill is a casual yet upscale bistro with a comfortable, friendly, and sophisticated atmosphere. When you visit, try their signature dishes like Panko-crusted sea scallops, Szechwan duck breast, and pork mignon. You won’t be disappointed! 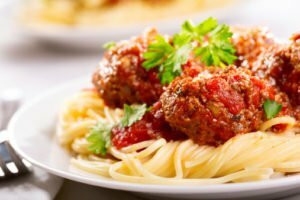 Mama Nina Foccacheria is a family-owned restaurant that has served authentic Italian cuisine to area residents and visitors for over 30 years. One of the best Italian restaurants in Bethlehem, you will enjoy fresh salads, hearty pasta dishes, and cheesy gourmet pizza slices. In addition, the restaurant is BYOB. You are free to bring a bottle of vino with you! This is a great option for visitors fresh off a day on the Lehigh Valley Wine Trail. One of several Bethlehem, PA, restaurants located downtown, Olive Branch is a cozy Levantine (Middle Eastern) establishment. Diners like the warmness of the staff and the authentic Middle Eastern Flavors. Favorites among patrons include the stuffed grape leaves and the kabobs. Located in nearby Center Valley, Melt offers diners wonderful pasta dishes with fresh sauces. Modern twists on old favorites are available at Melt, and the menu also includes appetizers and pizza. If you are looking for a local landmark to visit, you need to visit the Bethlehem Dairy Store. It has a wide variety of homemade ice cream that keeps patrons coming back time after time. Called “The Cup” by locals and visitors, a range of choices including ice cream sandwiches, frozen yogurt and milkshakes is sure to satisfy all ice cream cravings. 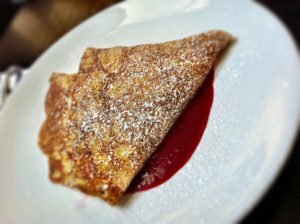 Full of Crepe offers delicious crepes with both sweet and savory fillings. They use fresh ingredients and customers are able to see crepes being made. Their knowledgeable staff will ensure you order your perfect crepe. Space is tight, but there are plans for additional seating and you can always take your crepe with you to enjoy on a park bench. Perfect for a hearty lunch or dinner The Mint Gastropub offers a tempting menu filled with contemporary comfort foods. In addition, the restaurant also offers distinctive cocktails and unique craft beer selections. Take Advantage of Our Winter Foodie Special and Discover the Best Restaurants in Bethlehem, PA! There is no better way to explore the best restaurants in Bethlehem, PA than with a stay at the Sayre Mansion. This winter, we are offering incredible Winter Foodie Special that includes an overnight stay for 2, Sunday through Friday, in one of our lovely queen size rooms. The package comes with a $100.00 gift certificate for dinner for 2 at your choice of these fabulous downtown Bethlehem restaurants: Tapas on Main, Apollo Grill, Edge Restaurant, The Mint Gastropub, or Molinari’s. Our Bethlehem bed and breakfast is located in the heart of town and is within walking distance of many of the eateries mentioned above. After an indulgent meal, our elegant and comfortable guest rooms are the perfect place to unwind. Then, the next morning, you’ll start the day’s adventures with a delicious complimentary breakfast! Browse our guest rooms and special packages today. Then, give us a call to help you plan a Lehigh Valley getaway you’ll never forget!